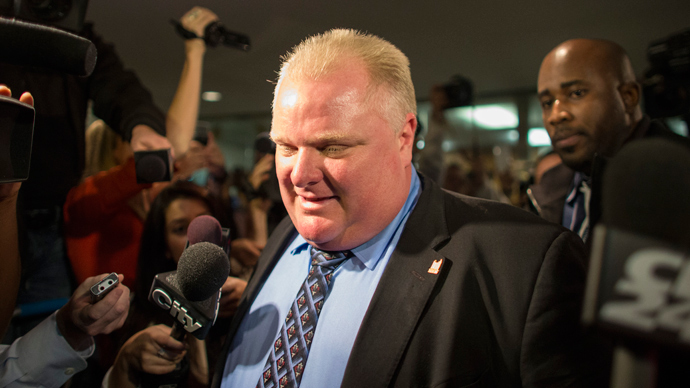 Toronto Mayor Rob Ford says he will take a leave of absence from his job and re-election campaign to address his substance abuse problem. The statement comes after a new video surfaced of the mayor reportedly smoking crack cocaine last weekend. The Globe and Mail has allegedly obtained new footage of Ford smoking crack in his sister’s basement early Saturday. The unreleased clip – viewed by two Globe and Mail reporters – shows Ford “taking a drag from a long copper-coloured pipe, exhaling a cloud of smoke, his right arm convulsing,” the newspaper claimed. The footage is part of three videos that “a self-professed drug dealer” says were filmed around 1:15 a.m. on Saturday. The dealer is now hawking the tape for “at least six figures,” according to The Globe and Mail. 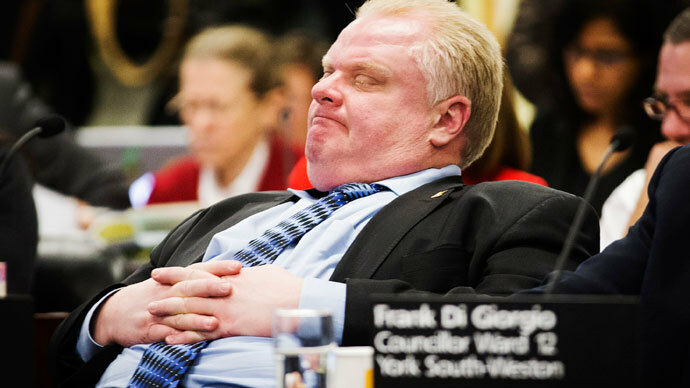 Ford told the Toronto Sun he's "ready to take a break" from his duties as mayor. "I have tried to deal with these issues by myself over the past year. 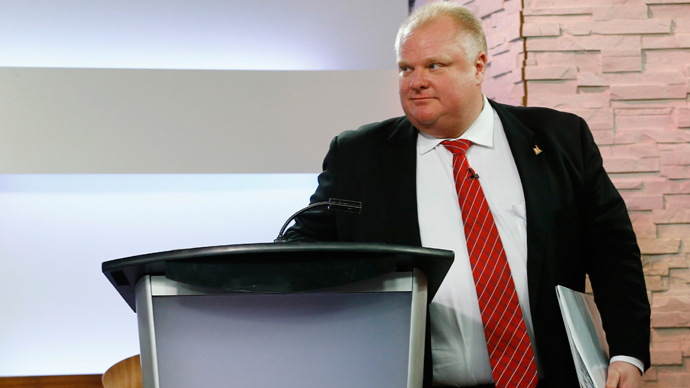 I know that I need professional help and I am now 100% committed to getting myself right," Ford said in a statement. "I love the people of Toronto, I love being your mayor and I hope you will continue to stand by me." Ford’s criminal lawyer and family friend Dennis Morris first announced that the mayor was taking a temporary leave of absence. "He acknowledges he has a substance abuse problem and he wants to do something about it," Morris told AP. After months of allegations that he was caught on video smoking crack cocaine, Ford admitted in November to using the drug in one of his “drunken stupors,” but denied that he was an addict. He has been plagued by further allegations of drug use and other scandals ever since. Morris said he is not sure how long Ford will take leave, as he is up for re-election in October. “I think the way it works is how long is necessary,” Morris told The Globe and Mail. 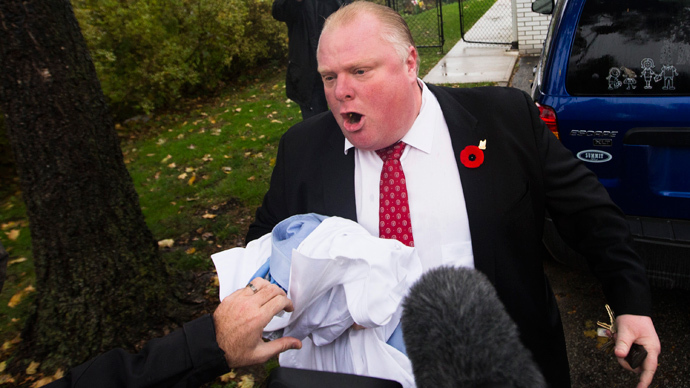 In one of the clips purportedly showing Ford smoking crack, the mayor is described as “rapidly [shifting] his weight back and forth on the spot, talking into his cell phone and his right arm swinging at his side.” The camera pans to feature a man who appears to be Alessandro “Sandro” Lisi, a confidant of the mayor and an “accused drug-dealing extortionist,” The Globe and Mail wrote. Lisi did not respond to request for comment on the videos. “I think the only thing I can tell you now is that, until such time the video’s contents are authenticated, it would be inappropriate to comment any further,” said Lisi’s lawyer, Seth Weinstein. Ford’s sister Kathy, an admitted drug addict, is seen sitting next to her brother in the video.